JEGS Air Cleaner with Logo 14 in. x 3 in. JEGS 500052 - Air Cleaner with Smooth Top 14 in. x 3 in. 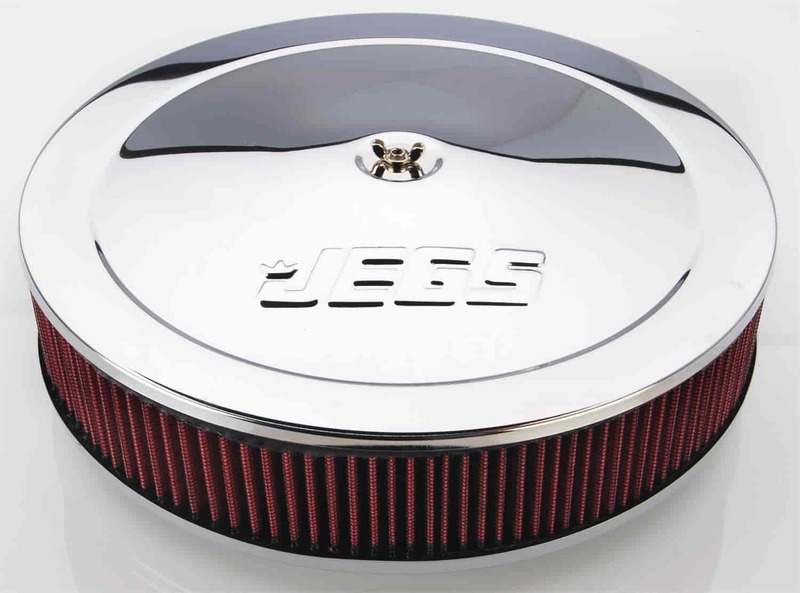 JEGS 50002 - Air Cleaner with Smooth Top 14 in. x 3 in. Height from mounting flange: 3.18"
50022 is rated 4.5 out of 5 by 2. Rated 5 out of 5 by rickerous from looks great fits great on my 650 holley, it adds the hot rod look.but the threaded rod it came with is not long enough, no big deal just 1/4 x 20 threaded rod works good. Rated 4 out of 5 by 69C10Chev from Good product for the price. Nice looking air cleaner, seems to be well made. Chrome plating is adequate. The filter element has a large dent on the edge, not large enough to prevent it from sealing, but can visually unappealing.